As expected, Google has announced their new Google Music store which includes partnerships with 3 of the 4 major record labels. You can access the store via the web today followed by the Android Market in the coming days. Another step towards turning our Android devices into complete media and entertainment vessels has been taken. Cloud, web and mobile access: You can access your music from anywhere at any time. Purchases can be made through your mobile device or via the web. After purchasing, your music can go straight to the cloud if you like to make it available from your phone, PC, or other entertainment device. Staying FREE: The 20,000 beta limit that Google introduced a few months back is staying for good. If you want to use Google Music, you can store up to 20,000 songs for free without having to ever pay a fee. Obviously you’ll have to pay for the music you buy in their store, but your current library is all good. Exclusive content: At launch (meaning now), Google Music will have exclusive content from Coldplay, Busta Rhymes, Shakira, Rolling Stones, Pearl Jam and Dave Matthews Band. Discover new artists: Google will recommend music to you based upon your library. We won’t know how good of a job it will do until we start using it, but we like the idea of having new music presented to our plates on a regular basis. 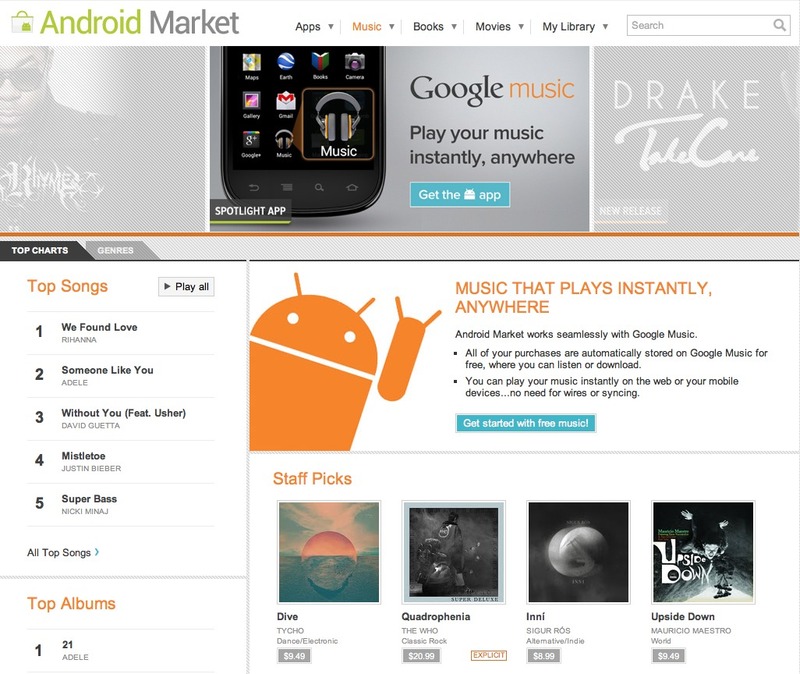 Free music: There will be a constant stream of free music available on Google Music. Free songs of the day and other tracks from featured artists. Sharing with Google+: All of the music that you buy can be shared immediately with your friends on Google+. And we aren’t talking short clips, we are talking full tracks and albums. Pretty cool. The store is open right now via the web, and we should see Android Market integration within the next few days. We will obviously need a new version of the market in order for that too happen, so keep it close as it will likely get pulled from some lucky chap’s phone.